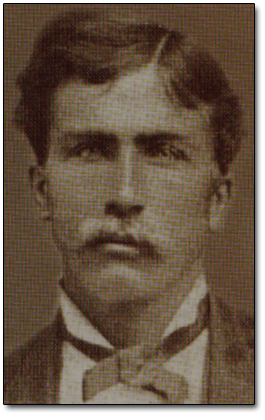 Thomas Stevens was born on the 24th of December in 1854 at Berkhamsted, Hertfordshire, England. 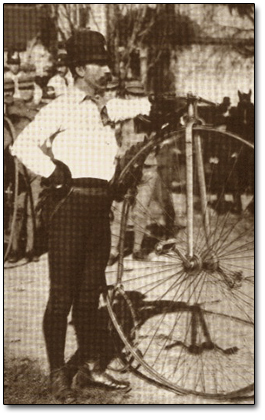 Known as the first person to circle the globe on a bicycle, he passed away in London on the 24th of January in 1935. His epic bicycle journey started in San Francisco on April 22nd of 1884 and was completed with his return there on December 17th of 1886 after having circled the globe on land. Thomas had an older sister, Bridget, and another younger one named Jane. He went to Bourne Charity School, then became an apprentice grocer. His father emigrated to Missouri in 1868 but returned when his wife became ill and before the rest of the family could also go to America. Thomas went to America with a half-brother but without his parents and sisters in 1871. The rest of the family followed two years later, moving first to Denver and then later to San Francisco where Thomas first learned to ride a bicycle. A two year long stint in a Wyoming railroad mill ended when he was run out of town after it became known that he was importing British laborers in exchange for part of their salaries. He later found work in a Colorado mine where he came up with the idea of riding a bicycle across the country. 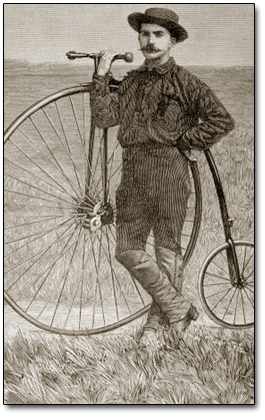 In 1884 he acquired a black enameled Columbia 50-inch large- wheeledStandard, also known as a penny-farthing, bicycle with nickel-plated wheels, built by the Pope Manufacturing Company of Chicago. He packed his handlebar bag with socks, an extra shirt, a raincoat that doubled as a tent, blanket and bedroll, and a .38-calibre Smith & Wesson handgun and left San Francisco at 8 o'clock on the 22nd of April in 1884. From Sacramento, Stevens travelled through the Sierra Nevada Mountains to Nevada, Utah, and Wyoming. 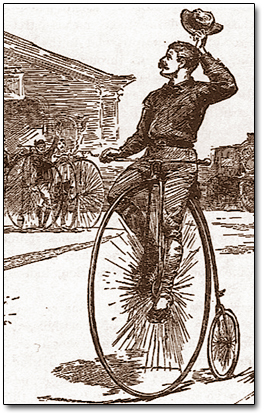 Along his route he was greeted by members of local bicycle clubs - most prominent being the president of a chapter of the League of American Wheelmen in Laramie, Wyoming. He reached Boston after riding 3,700 miles on wagon trails, railway beds, canal towpaths and public roads, to complete the first transcontinental bicycle ride on the 4th of August 1884. At the time, Harper's reported that More than one-third of the route followed by Mr. Stevens had to be walked. Eighty-three and one half days of actual travel with twenty days of stoppage due to weather conditions, made a total of one hundred and three and a half days consumed in reaching Boston. He followed the old California trail most of the way across the plains and mountains, astonishing the Indians, and meeting with many strange adventures. Stevens passed the winter in New York and contributed his own sketches of his transcontinental trip to a magazine called Outing. The magazine made him a special correspondent and sent him on the steamer City of Chicago to Liverpool where he landed 10 days later on the 9th of April 1885. He left his bicycle in the underground storerooms of the London & North Western Railway and took a train to London to arrange his crossing of Europe and investigate the conditions in Asia. He was assisted by an interpreter at the Chinese Embassy who discouraged him from riding across Upper Burma and China. He returned to Liverpool on the 30th of April 1885 and on the 4th of May commenced the formal start of his ride around the world at Edge Hill Church. There several hundred watched him leave amid a small sea of hats enthusiastically waving aloft and a ripple of yells coming from the 500 English throats as he mounted his bicycle. With the assistance of a few policemen another 25 Liverpool cyclers have assembled to accompany Thomas. Within minutes of extricating themselves from the crowd, mounting their bicycles, and falling two abreast and excitedly wheel down the lane and out of Liverpool it began raining. As he rode, always wearing a white military helmet, through England he passed through Berkhamsted, where he was born and noted that roads in England were better than in America. After arriving in Newhaven he took a ferry to Dieppe in France and continued through the French countryside. His descriptions of his ride through Germany, Austria, Hungary, Slavonia, Serbia, Bulgaria, Rumelia and Turkey are not only very interesting, but also often very humorous. His thoughts about different cultures and people are generally very perceptive without being negative, overly critical and more than often quite humorous. His descriptions of Turkish village life are much the same as one would find them today more than 120 years later. In Constantinople (Istanbul) he rested among people who had only heard of America, refitted his bicycle with spare spokes, tires and other parts as well as obtaining a better pistol. He waited for reports of banditry along the Black Sea coast to subside, and then pedalled off through Anatolia towards Armenia, Iraq and Iran, where he stopped during the snows of the winter in Teheran as a guest of the Shah. Stevens was refused permission to travel through Siberia by the Russians, so he decided to get permission to cross Afghanistan. Again, he was told by both Afghanis and his own British government to forget this as it was considered far to dangerous because of bandits. He decided to ignore these warnings and cross Afghanistan in order to enter India. So he set off on 10 March 1886 through Afghanistan but was arrested and expelled by local authorities. He was taken back into Persia and after having retraced his earlier steps, took a Russian steamer across the Caspian to Baku. From there a railway to Batoum; a steamer to Constantinople and then finally onboard a boat to India with 130 mules on the deck and few human passengers. He cycled across India enjoying the weather, the excellent Grand Trunk Road which offered easy riding and freedom from bandits. Once across India another steamer took him from Calcutta to Hong Kong and southern China. 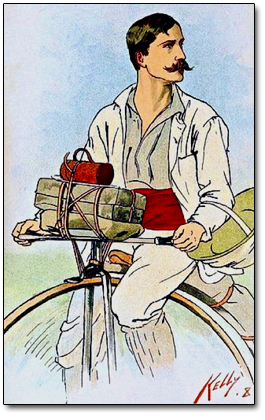 He pedalled through eastern China where he encountered great difficulty due to the language. From the coast of China he took a steamer to Japan where he found an extremely calm and welcoming country. The bicycle part of his journey around the world actually ended on the 17th of December 1886 at Yokohama, Japan. Stevens returned by steamer to San Francisco in January of 1887. The Pope Company preserved Thomas Stevens bicycle until World War II when it was donated to a scrap drive to support the war effort. The New York World contacted Stevens in 1888 and asked him to join its search in East Africa for the explorer Henry Morton Stanley. Stanley had travelled up the Congo and a year and a half had passed without any news from him. Stevens called it a grand opportunity - the one chance, perhaps of a lifetime, to spring into fame on the stage of an African exploit. Stevens left New York by ship on the 5th of January 1889. His instructions were to go to Zanzibar, investigate the state of affairs there, and let the New York World know the truth about the troubles between the Germans and the Arabs as well as see what is to be seen of the slave trade. Find out all that he could about Stanley and Emin Pasha, and, if necessary or advisable, organize an expedition to penetrate the interior of the continent for reliable news of the Emin Pasha Relief expedition. He was told to spare no expense in carrying out the main object of the enterprise, but at the same time not to throw money away recklessly. Stevens led a six month long expedition, writing for the newspaper about climbing Mount Kilimanjaro and hunting big game. He found Stanley's camp in a race with the rival New York Herald and wrote his book called Scouting for Stanley in East Africa. By the end of February, 1890, he was again in New York after having been gone fourteen months. He had not found Stanley, as Stanley had found Livingstone in 1871 because the circumstances were altogether different. But he had, however, gratified a pardonable journalistic ambition in being the first correspondent to reach him and to give him news of the world after his long period of African darkness. That he had done this under the most trying of conditions, Mr. Stanley fully appreciated and warmly reciprocated. Every courtesy that was in his power to proffer while on the march to the coast, whilst in Zanzibar, and later in Egypt was extended to Stevens by Stanley. The price of an original has been placed at between $300 and $400.